Solas is, I believe, half-mad, and existing in a waking nightmare. We excuse our choices in "In Hushed Whispers" because that world "isn't real." But, well, to Solas...? Neither is this one. ALICE: He was part of my dream, of course — but then I was part of his dream, too. FELASSAN: They’re stronger than you think, you know. 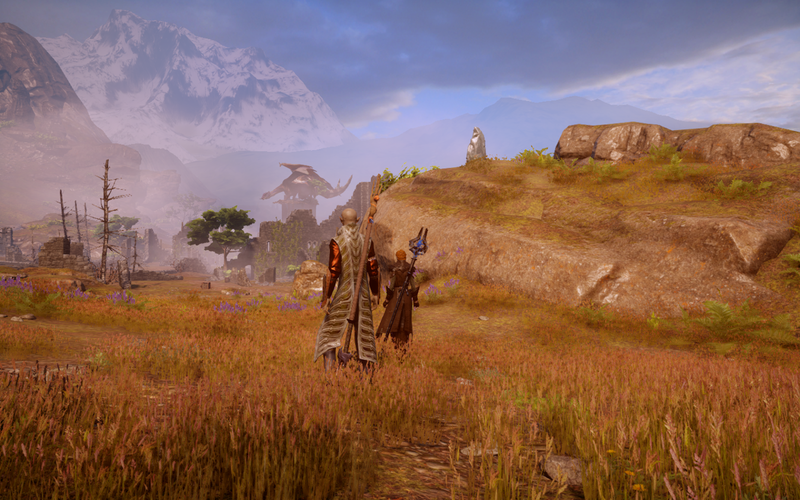 I've been writing several posts about Solas and his romance over the past few weeks, which means that I've also been thinking a lot about dreams, and about Solas's powers within the incredible and richly textured dream-world of the Fade. I've been thinking especially hard on how his long sojourns there may have impacted his waking life and actions in Inquisition, as well as upon how they may also have impacted his sanity. After all, if you think about it, at the starting point of the events centered around Dragon Age: Inquisition, after his long sleep, Solas may have spent more of his life in the Fade (by a sizeable margin) than in the real and waking world. He has most certainly spent most of the last 8,000 years there—in a world where all knowledge is accessible to him, where he can shape his reality, his landscape, his environment, with exquisite detail. Where he has total control and wields an unbelievable amount of power. But a dream-world is also notable for other aspects. A dream is a dream is a dream. The lighting is a little rosier. The air is sweeter. There's no sweat or blood or dirt or bad breath in a dream. All the little rough spots smoothed over. All the ugliness—even in the nightmares—simplified. 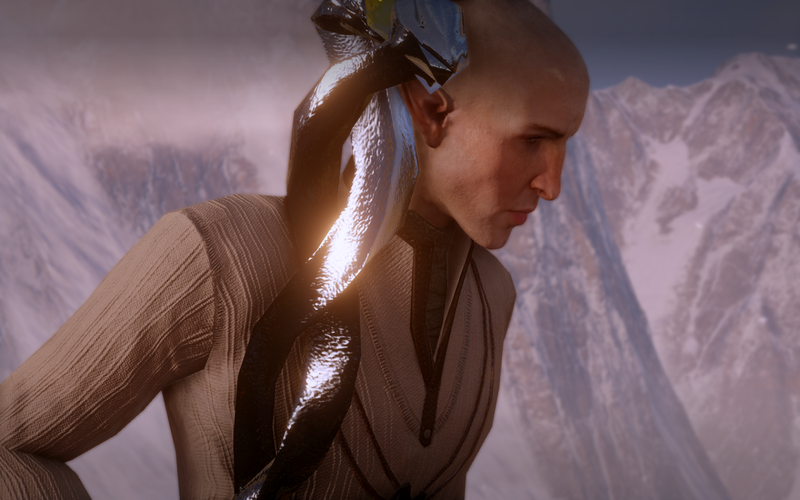 Part of me even wonders if Solas's first kiss with the Inquisitor takes place in the Fade because, well, everything and everyone is prettier there, easier to take. If he has been thousands of years without a touch upon living skin, of a kiss upon the lips of a living woman, it's no wonder that the Fade kiss is his easiest entrance into waking life just when he's finding the real world at all palatable. Even time would be flexible in the Fade, as time doesn't matter in dreams, after all—it speeds or slows as needed. Distance is equally irrelevant. All that matters is perception, emotion, feeling. And power—dreams are incredibly powerful, and we are often incredibly powerful within them, ourselves. And we aren't even dream-masters. 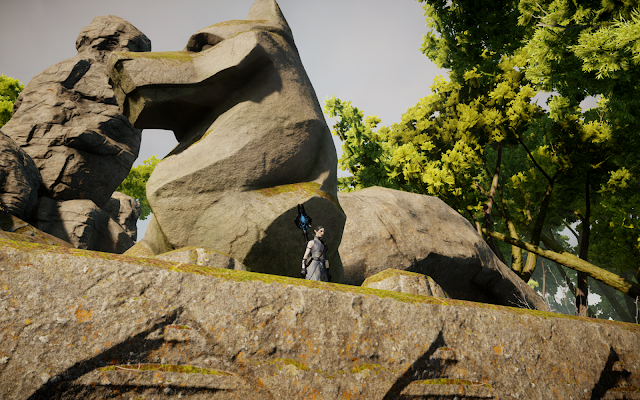 So is it any wonder that Solas enters the stage with a massive superiority complex? This is someone used to things going his way, someone who has spent most of the past eight thousand years in a universe that he can command, control and shape to his will. 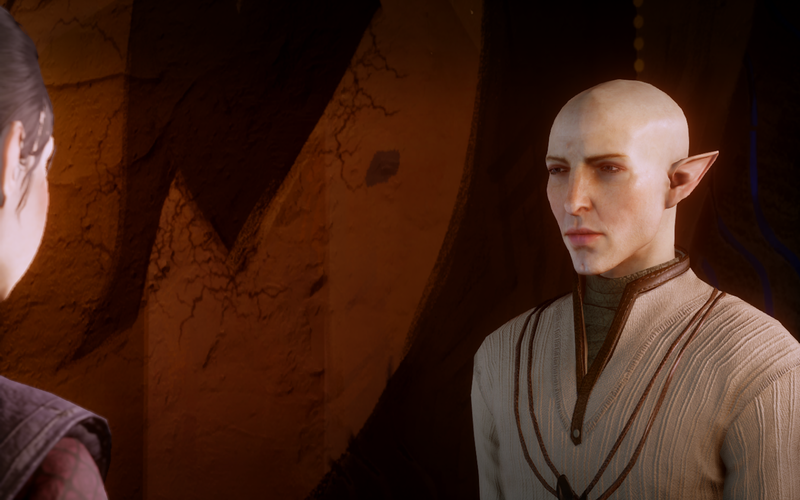 His visible disgust with the world in which he finds himself, in the beginning, is therefore not so much a symptom of Solas's bigotry as it is of his difficulty with acclimating to the real world, as well as of his open yearning to go back to where things make sense. 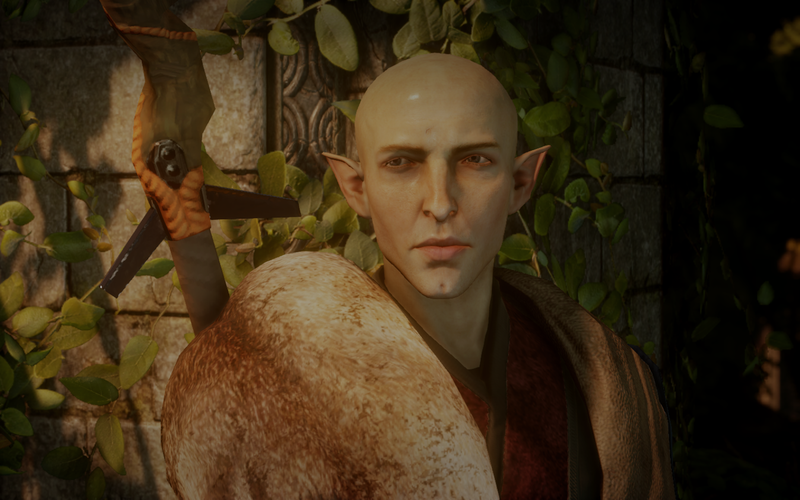 No wonder all Solas talks about when we first meet him is the Fade. He's homesick. To me, it's all too understandable that Solas is, to some degree, addicted to that world of dreams in which he wields so much power—not least because it lacks the limits imposed by the physical world. It's also why I think he speaks of the Fade with such longing and frequency when we first meet him, as well—he's left that beautiful kingdom where he holds such supremacy and command, and for the past year or two now has found himself walking a world of waking nightmare. He would love to go back, but he has things to do here in the ugliness of reality... things he would rather not do. awakening from his long sleep isn't actually real. Just one possible universe among many. The thing is... I think this is the key to who Solas is when we meet him. He may be walking in the living world, but his mind is still back in the Fade. And so is his perception of the reality in which he finds himself—and of its beings. And of the choices he makes here... and that he allows himself to make. In other words, I think part of Solas still feels like he's dreaming. The reality in which he finds himself is no more permanent than the reality of a dream. To me, this is the single most dangerous and terrifying secret to who Solas is in Dragon Age: Inquisition, and even, to some extent, through "Trespasser." Sure, Solas is by all appearances awake now. Present, living, interacting. He seems awake. But I think he's still acting like everything's not quite real. Like things are changeable, impermanent... dreamlike. And so are lives within that reality. And so he can gamble them with impunity. I've even wondered if, after wandering the Fade for thousands of years, Solas has sometimes forgotten how to tell the difference between the dream and waking worlds at all. To be fair to Solas, his dialogue about those moments is sharp, present, and keenly attuned to the situation at hand. He is certainly aware that he's dreaming, for instance, when he visits the Fade with a romanced or high-approval Inquisitor. Doesn't matter. I still think Solas is, ever so slightly, not in his right mind. He's certainly (justifiably) traumatized, and I'd argue that he's also become destabilized and unbalanced by the cataclysm he unleashed, and all he can do now is pull himself through the unpleasantness and pain of the waking world while thinking feverishly of the best way to discard this reality and bring back the universe where things made sense. This is also why I believe he's so calm when sent physically into the Fade... because I think there's literally nothing the Nightmare can say to upset him there. He's lived it all, a thousand nights or more already. A thousand, thousand nights. And he remembers every moment. And every time, I guarantee that he tells himself, "It's not real." As a reminder. As comfort. Whenever these pesky fragile creatures get to him. Whenever they make him think they may have lives and feelings of their own. It's always interesting when you've played DAI at least once, to play through later on and to see the Nightmare's sly comment to Solas. The Nightmare seems abrupt and blunt, barely trying. As if it recognizes (as it should) that it cannot sway this particular object. 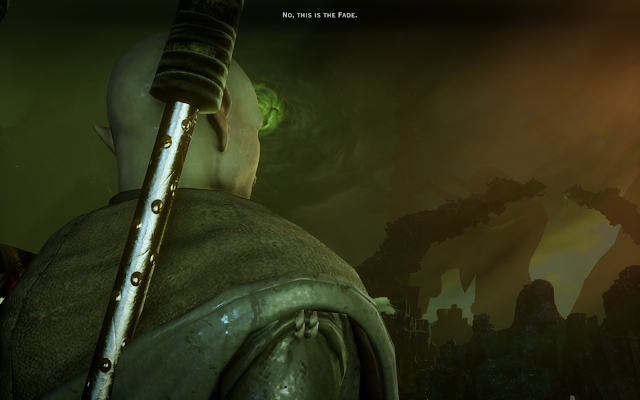 The Nightmare speaks to Solas: "Dirth ma, harellan. Ma banal enasalin. Mar solas ena mar din." Which, for me, translates literally to: "Talk to me, Rebel. Your victory was nothing. Your pride begins your death." I've seen some who interpret it instead as "your pride appears dead." But I think given the syntax and phrasing here, that it is more ominous than that. I could also make a case for "Tell me, Rebel, of your empty victory. Your pride will lead you to your death." I could further make a case for "Your death emerges from your pride." To me, this interpretation also works better with Solas's response. And Solas brushes it away almost peremptorily. He responds with, "Banal nadas" ("Nothing is inevitable/certain"), but which again I feel is more Solas being sly and speaking in multiple meanings, depending on emphasis. He's not just saying "nothing is inevitable." He's also, I would argue, saying that nothingness itself is inevitable, that he knows he is doomed to failure but that he can allow himself to walk no other path. Like, not just "We can't know anything," but alternatively, and more terrifyingly, "Nothing we do matters." Meanwhile, no worries, either way... it's all a dream. What is real? If you're going to ask anyone in Dragon Age: Inquisition, don't ask poor Solas. I believe he hasn't a clue. I think Solas was very aware of what his pride had wrought centuries before his official awakening, as he'd seen it all from the Fade. I suspect he thought he had mastered his reactions, that he thought he was okay about things (or that he could fix them), until his physical awakening. When it all hit him more powerfully than he could have expected. And here's where I think the temporary insanity kicked in, in earnest. Where he became focused on righteousness and restitution. His answer in fury and disbelief was simple: This isn't real. Once he fixes things, he thinks, the world will be right again. The way it should be. It's why Solas's first truly villainous action, that of getting the Orb to Corypants in order to unlock its power, probably doesn't affect him much, at first. And it should—after all, it's the first time in his entire journey when he does something that is evil and indefensible. Did he think the Breach and catastrophe of the rifts would occur? No, I don't. I genuinely think he thought Corypants would unlock the Orb, and die in the attempt. Solas would have then used the unlocked Orb to "fix" reality and restore the past. Either way, if this reality is simply temporary for Solas, much like the one in which the Inquisitor finds herself in "In Hushed Whispers," then nothing he does here is blameworthy—as long as he can get back to the point where everything changed. If he can reset this world back to where things made sense, all will be forgiven. Nobody will even remember otherwise. I think it's worth pointing out that in "In Hushed Whispers," the Inquisitor never has to question whether what they are doing is right. Her companions urge her on even at the spending of their own lives. Death is immaterial. All that matters is 'fixing' the world back to how it should be. 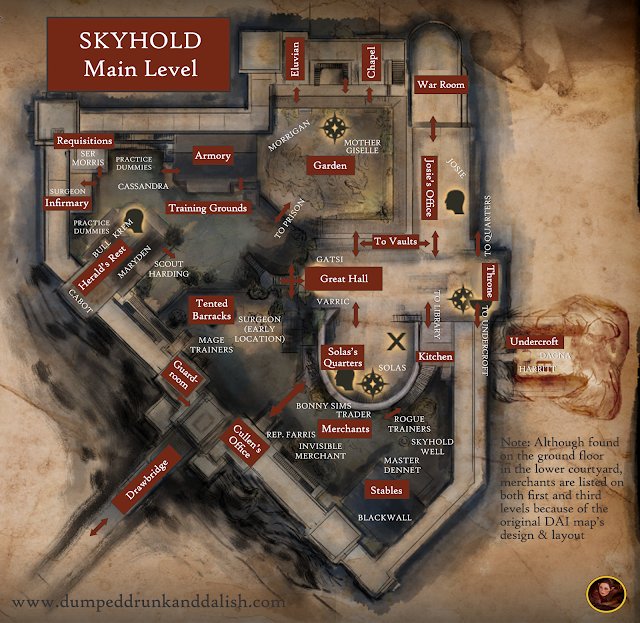 Is Solas's situation any different? He himself would certainly argue that it's not. The only difference is that he's not the hero of this story. I'd simply say: To his credit, he knows that. you had attempted to free the slaves, fight for your people, and avenge the murder of the one you loved most? Meanwhile, dreams are tricky things. Dreams are dangerous, ephemeral, seductive. Dreamscapes are places where nothing is necessarily permanent. Where actions may not have consequences. Where everything is centered on us, ourselves. Where the question "What is real?" may not matter at all. Which makes it richly ironic that one of the greatest lessons Solas must learn in the story of Dragon Age: Inquisition is the nature of reality; and that the beings he meets in living Thedas are as real, vital and worthy as those of the civilization he has lost. I mean, yeah, it's an obvious lesson for someone to have to learn, especially given Solas's brilliance, but then again, the brilliant are often the most blind. Solas has spent thousands of years trapped in his own dreams (and nightmares), then awakened, traumatized, to the terrifying and agonizing fresh realization that he'd doomed what he tried to save, killed what he tried to protect, and that he was now nothing more than a joke, a maligned and forgotten relic—a simplistic villain, hated by his people and used as a warning to frighten naughty Dalish children. And when he approaches those very Dalish, the vestiges of the elven people in this terrible new reality, they turn him away. His most loyal friend and lieutenant is dead by his own hand. He's no longer a ruler, a rebel, a wolf, or a god—at least, not in this place. And at first, he's so weakened after his long slumbers that he's barely even a mage anymore. And he's alone—more alone than he's ever been. That's a hell of an awakening. holds himself solitary and apart? This is why I can forgive Solas, especially early on, for the ice of his condescension, and for the rage of his own regret and powerlessness. Is it any wonder he speaks of the Fade with such yearning? That he holds himself solitary and apart? Then the dream softens. His trauma begins to heal. He begins to allow himself to be vulnerable, to react to things, to feel things. Everything changes when he meets the Inquisition... when he recognizes Cassandra's faith, Bull's vulnerability, Varric's acceptance, and Cole's compassion. When he watches the people of Thedas and recognizes their courage... and how they refuse to submit—even to a world raining demons. And most of all, he changes because of her... when he allows himself to fall in love. And he only allows that all-important first touch, that first moment, because it occurs where he is most himself... In the Fade. Where everything is allowed. Where everything is permissible. Where he feels safest. Where nothing he does matters. In looking back here, I was reminded of the wonderful and underrated show "Angel," and the conundrum, quoted above: "Nothing we do matters." And of the show's incredibly moving response, the only one possible for thinking beings: "If nothing we do matters, then all that matters is what we do." It's a lesson Solas, alas, has yet to learn. But I believe that he will. Even if he must visit a dream to do so. Or a nightmare. Elana, apologies for the late reply to such a thoughtful comment. As always, you make some great points here. First and most importantly, I hope I wasn't coming across as generalizing on mental illness or the question of 'insanity' as a thing, because I would never do so. I was using the word 'mad' in the more gothic sense here. To me, it's implied that the Evanurian culture (and that of the elves under it) was rather decadent and slightly Greco/Roman way that both mirrors the Tevinter that was to follow, but which was also different. To me, it seems like the elves were obviously incredibly emotional and hot-blooded people (in good and bad ways), and eventually allowed that decadence and pursuit of pleasure and power to consume them. I agree that Felassan is missing here! I was purposely saving him for a later piece (I post about him at length in my new piece on Solas's romance and the Fade Kiss). I will also be addressing the loss of Felassan -- his murder by Solas -- specifically in a future post. Felassan is incredibly important to Solas's story and journey. When I state that Solas is battling for his sanity here, I would note that he may seem fully sane, and yet he also lets slip these little moments that show his ability to compartmentalize and remove himself from consequences. The "these people aren't real" element is where I feel like he's hiding. He can be mostly or even fully sane and yet still somehow believe the reality he is living in isn't actually real (when it demonstrably is). This is what I feel like I see in Solas here. I don't know if I can fully quantify the Fade as an actual literal addiction for Solas. I do agree that he is far too dependent on it, and to an unhealthy degree. But it's also his place, where he is most comfortable (and if he was once a spirit, where he was originally born and lived). For me it's more like he needs to correct the balance. For instance -- someone who is agoraphobic will find greater mental health by leaving their home on occasion as they recover, but I don't want to ever remove that home as a refuge for them, either. They can still find comfort there. It just shouldn't be the ONLY place they find it. You make great points about how he must feel in the Fade versus in the world -- I absolutely agree that for Solas, the Fade is emotional and vibrant, where things ironically feel most real to him. I also think the instance when he takes the Inquisitor to the Fade exhibits this in a beautiful, very subtle way. Haven has never looked prettier or more perfect. Thank you again as always for your wonderful and insightful comments! Apologies, I meant to call you Kinaed! Please forgive the error. I have felt that Solas has been undergoing a profound existential crisis since he has awoken compounded with his feelings of isolation and the shattering of his reality of what the world should be. Thank you for reading (and commenting)! I very much feel the same way. It's why I give him a pass, to some degree. The realizations he awoke to were pretty staggering and upsetting, and I feel like there's genuine, understandable trauma at play there. I wrote more about this in additional blog posts, so hope you will check them out and comment further!